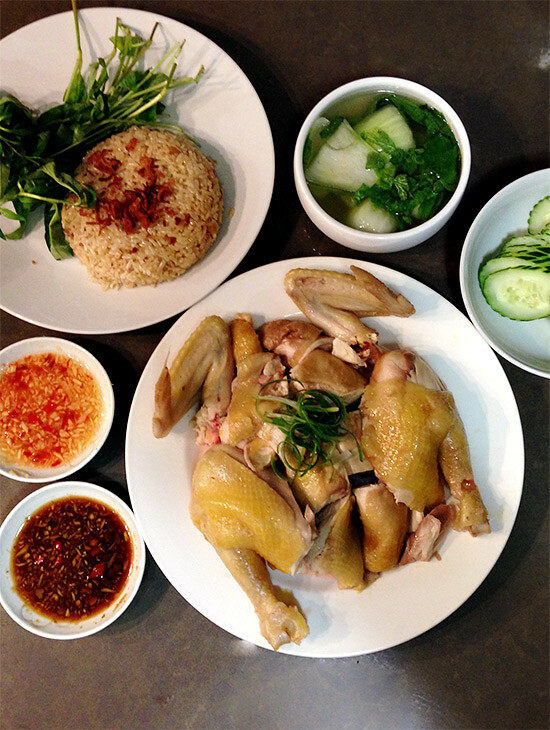 For a simple dish, com ga or chicken rice is a beloved dish in our family. Although it originated from a small island of Hainan or Hai Nam in the South China Sea between Vietnam and China, it’s popularity can be seen on menus throughout Asia. 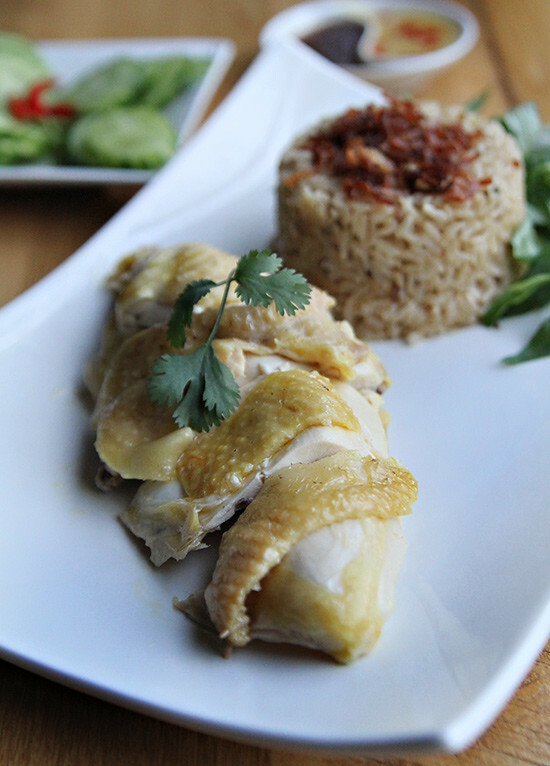 There are numerous variations (uses of aromatics, spices, dipping sauces) and claims for the best or most “authentic” chicken rice, but frankly, we think this is the one time where the ingredients make the dish. Since the chicken is the star, you absolutely have to have use the best chicken you can afford. At a minimum, your chicken should be free range. Organic free range would be even better, but that can be tough to find. If you have access to Vietnamese supermarkets, look for “gà đi bộ” or buddhist chickens with the head and feet still attached. These chicken have less fat and water content then your typical Tyson or Foster Farms chicken and yields much more flavorful tender yet deliciously chewy meat. Even the fat on these chickens is prettier shade of yellow and full of flavor and never gets thrown out. If the chicken is the star, the co-star would be the rice. Normally white jasmine rice is used but we switched to brown rice exclusively for health reasons. Whatever rice you use, it’s simply not enough to just cook the rice in chicken broth. You need chicken fat and plenty of aromatics to truly give the rice the depth of flavor it needs. After poaching the chicken, we use the fattiest portion of the broth and and combined with sauteed garlic, shallots, ginger, and lemongrass. Cook it any way you like, be it stove top or rice cooker. We then take it a step further and sprinkle crispy shallots prior to serving. Finally, with the leftover broth that you haven’t used for the rice, we create a soup with whatever seasonal vegetable we have on hand. Some restaurants just serve broth, while in Thailand cubes of wintermelon is added. Adding fresh seasonal vegetables quick and easy. When it comes to accompaniments and dipping sauces, again there is wide variation. We prefer thinly sliced cucumbers and some sprigs of rau ram. If we don’t have that, we use cilantro. Occasionally, when in season, we like finely mince keffir lime leaves. For sauces, we prefer ginger nuoc mam cham and the Thai style sauce of soy sauce, soy beans, and ginger. While the rice is cooking in the broth and aromatics, let the chicken cool down enough to handle. We simply use poultry shears to break down the chicken, it’s a truly a snap! Instead of individual portions like in restaurants, we serve this family style letting our guests pick and chose the tender morsels. Try this simple com ga hai nam for a family meal and you won’t be disappointed. In fact, try it for a dinner party as it doesn’t take much more work in cooking one chicken or four! You’ll be amazed how a great ingredient cooked simply, can be such an amazing meal. 1 large knob of ginger. Peel and slice 1/2 of knob. Mince remainder and divide in two portions. 2 large shallot, one whole peeled and mince other. 2 stems of lemongrass. Bruise one, and finely mince the other. In a pot large stock pot combine the chicken (optional: stuff the aromatics inside the chicken cavity) with the sliced ginger, lemongrass stem, shallot and water. Cover and bring to a low simmer over medium heat. Reduce the heat to low and simmer until internal temperature is 82 C or 180 F, roughly 10 min per lb. Meanwhile in small pan, add cooking oil and sautee minced garlic, 1/2 of the minced ginger, minced shallots, minced lemongrass until browned and fragrant. Turn off heat and set aside. When done strain any impurities, remove chicken and cover loosely with plastic wrap and set aside to cool. Ladle the fatty portions of the chicken broth into your rice cooker in the same amount as you would normally use with water. Add the sauteed minced garlic, ginger, shallots, and lemongrass mixture into the rice and mix. Cook according to your rice cooker's directions. Remove the slices of cooked ginger, lemongrass and shallot from the remainder of stock. Add your vegetable of choice and cook by bringing back to boil. 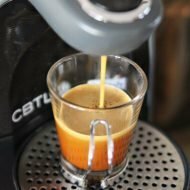 Turn off heat and season to taste. Prepare the dipping sauce by adding 3 tbs of nuoc mam cham plus 1/2 ts sugar to the remainder of the minced ginger. When cool to the touch, carve the chicken with your method of choice. 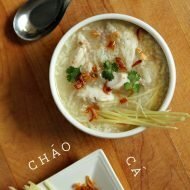 Serve family style with rice, soup, and nuoc mam cham gung. This looks amazing. 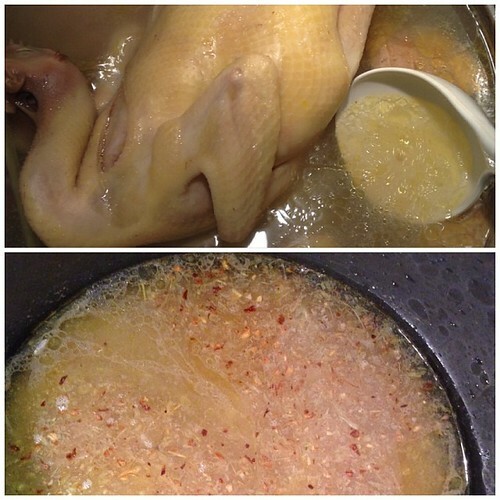 I’ve always wondered how to cook Hainan Chicken, can’t wait to try this myself! Thanks for sharing! 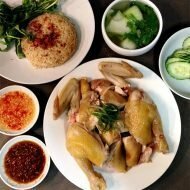 what is “Buddhist chicken” in Vietnamese? some places lable it that because it has it’s head and feet still attached. seen it called brown chicken too. Thanks for this beautiful recipe i love it,and I love the idea of using lettuce in this!Bet it’s completely delicious. i LOVE hainan chicken rice! having grown up in Singapore, I miss this dish so much. Can’t wait to try it out. 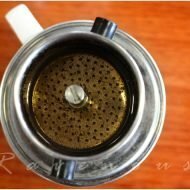 Love the blog as can always use a good resource of SE asian cooking. Keep it up! This is definitely one of my favorite Vietnamese dishes! Thanks for the recipe!